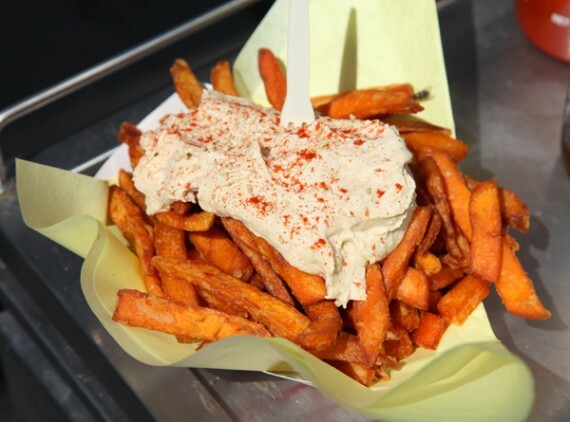 quarrygirl.com » Blog Archive » fresh fries food truck goes all vegan this weekend! the normally vegetarian truck boasts an insane menu of gourmet fries with a wide array of deluxe toppings. their vegan offerings have blown us away, but many of their sauces and toppings contain dairy and/or eggs. 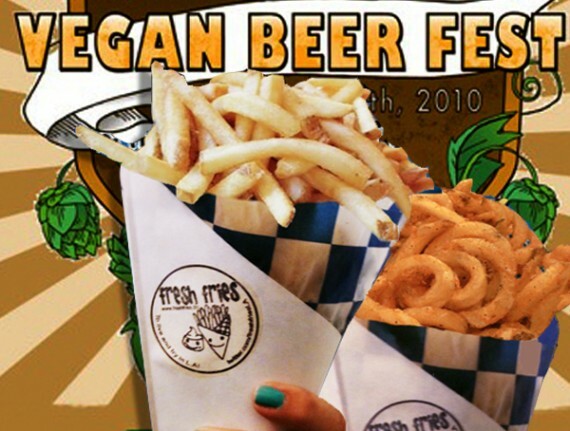 lucky for vegan beer fest attendees though, fresh fries is going TOTALLY ANIMAL-FREE! that means they are making their crazy homemade sauces with vegan instead of normal mayo, and they hinted to us today via email that they might even have a vegan cheese substitute! FINGERS CROSSED. we are beyond excited, because even their default vegan fries are delicious. I HIGHLY RECOMMEND the hummus and sweet potato combination! beyond incredible food for sale from our favorite food trucks in LA, the vegan beer fest is also gonna have loads of music and UNLIMITED CRAFT BEER included in ticket price. if you have plans for saturday, cancel them!